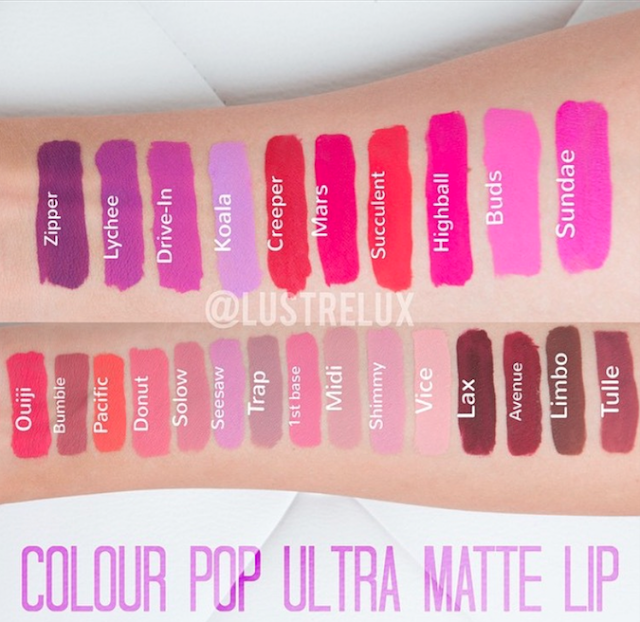 GUYS, CAN WE JUST TALK ABOUT THESE NEW MATTE LIQUID LIPSTICKS THOUGH?!! For all of those matte liquid lipstick lovers like myself, you know that this is a huuuge deal. When I heard that Colour Pop was coming out with their Ultra Matte Lip line, I was so excited. I love a good matte lipstick and liquid lipsticks are all the craze at the moment. The new line is being launched on June 25th and there are 25 beautiful shades being released. Best part about these is that they are only $6 each... Anastasia who?! Such a great price, hopefully they are as amazing as they appear. The color selection is beautiful, I know that I'm going to HAVE to get at least five of them. Let me know if you guys would like to see some lip swatches!! Hey everyone! So, yesterday I went to the mall with one of my friends and of course one of the first stores that I went into was Sephora. My skin lately hasn't been feeling it's best, with breakouts to dryness. My t-zone has been feeling pretty dehydrated and has been flaking and I am not one to have dry skin so I definitely needed some skincare therapy. 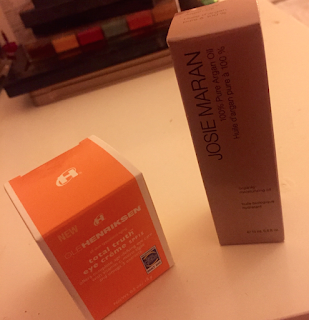 I picked up two items, the Josie Maran 100% Pure Argan Oil & the Ole Henrickson Total Truth Vitamin D eye creme SPF 15. The Josie Maran 100% Pure Argan Oil that I received was the mini, 0.5 oz size. I wanted to test it out before I purchased the larger size because girls... that's esssspensive. Sephora says that it is a lightweight oil to deeply hydrate and treat skin, hair, and nails which is one of the reasons I purchased it. It can not only be used on your skin but on the hair and nails as well which is great. When I put it on my face last night and this morning, it felt so good and this morning when I woke up, my skin felt so hydrated. So far, I like the way it felt on my skin and how I felt hours after applying it. 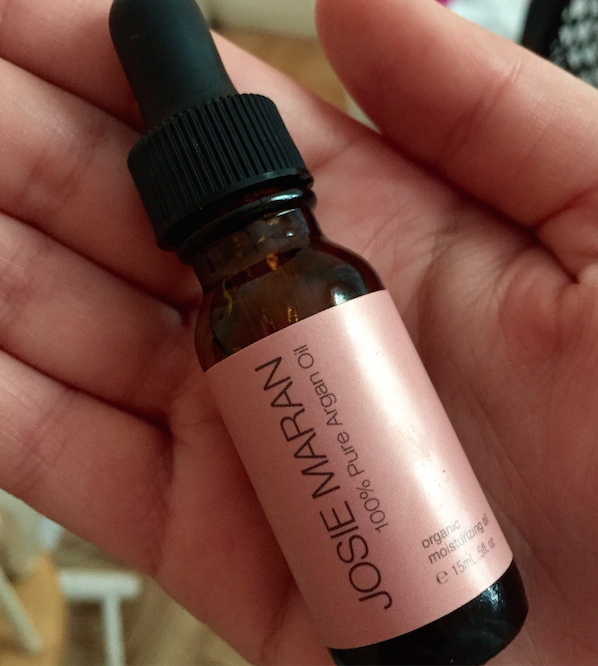 I like Josie Maran because it's products doesn't contain any sulfates or parabens and it's also packed with Vitamin E which I loooovveee. 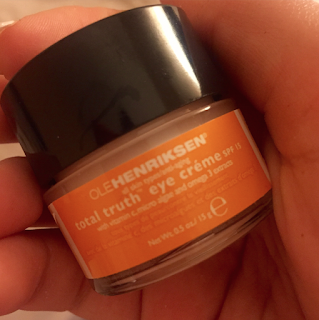 I also picked up the Ole Henrickson Total Truth Vitamin D eye creme SPF 15. The reason I picked this product up was because I have been looking for a good eye cream for awhile and all of the eye creams that I have previously tried didn't exactly WOW me. Ole Henrickson is an all natural brand and I've tried some of their products before which I liked so after speaking with one of the girls from Sephora, I decided to give this one a try as well. It's formulated with Omega 3 and has an SPF of 15 which is great because the sun is a killer.. It felt good on my eyes and it is kind of thick and rich, so a little goes a loong way. It is supposed to hydrate, nourish, diminish fine lines and wrinkles along with help with those dark circles we all hate. Let's hope I love this. P.S. Keeping those undereyes hydrated and healthy is so important, seeing as the skin underneath your eyes are so sensitive and thin! Plus, I've found that your concealer will never look it's best without a hydrated undereye area. So if you're into makeup, you know that over the last couple of years, brows have become extremely important. It's crazy to think that a couple of years ago, most girls' eyebrows looked paper thin and that was the craze. But now, a girl's eyebrows can make or break her. The Anastasia Beverly Hills brand has been known for their aaaamazing brow products such as the Brow Wiz and the Brow Pomade. The Brow Wiz is one of my favorites, they have great colors to choose from and they don't look fake on your eyebrows. BUT, the Brow Wiz retails for $21. I have tried searching for cheaper alternatives for awhile, but the drugstores did not do it for me. All of the products that I've tried look fake and the color selections are either too light or too dark. UNTIL... I heard of the new NYX Micro Brow Pencil. 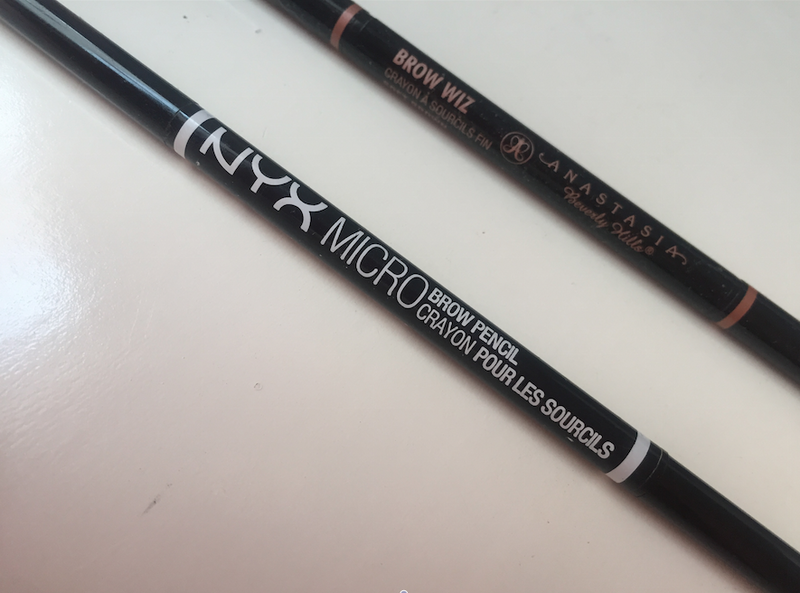 When I heard that NYX cosmetics was coming out with a eyebrow pencil, I was super excited and knew I needed to get my hands on it. NYX is a great brand and I love their products. When I saw how the Micro Brow Pencil looked, it looks almost identical to the Brow Wiz with a spoolie on one end and on the other end, the retractable eyebrow pencil. 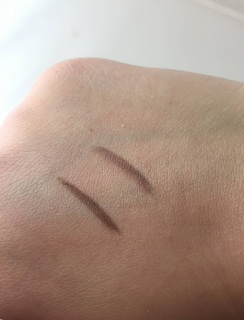 As you can see from the swatches, the color on the left of my hand is the Anastasia Beverly Hills Brow Wiz in the color Soft Brown. Right next to it is the NYX Micro Brow Wiz in the shade Ash Brown. These colors are almost identical on my hand and you can't even notice the slight difference on the brows. These colors suit my face so well and I love the way that they look. One great thing about the NYX pencil is that instead of $21, it's only $10!! It's such a greeeaat dupe and I bought mine at Ulta. 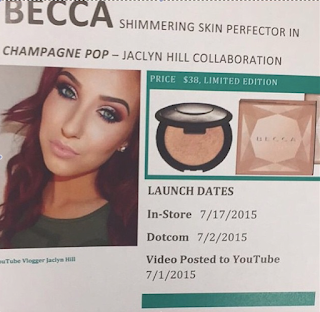 Becca + Jaclyn Hill Collaboration! New Highlight "Champagne Pop"
Guys, I'm literally dying. I don't remember the last time that I was this excited for a new makeup product. If any of you guys don't know, Jaclyn Hill is a makeup artist, known for her videos on youtube ---> https://www.youtube.com/user/Jaclynhill1 . She is absolutely amazing at what she does, such a doll and definitely one of my favorite Youtube gurus. She's done makeup collabs before, with companies such as Makeup Geek. But to find out that she's coming out with a new Becca highlight!! Becca is known for their beautiful highlights and in my opinion, their highlight in Opal has really changed the highlight game. Becca's highlights are such good quality and their formulation is amazing, so I am so excited to see the beauty of this one. It launches on July 17th, guys so don't forget to buy it! I can't wait to get my hands on it..
Do I hear a review coming up? So today I went with my mom to go get our nails done because god, my nails looked horrible. I got tips which I don't usually do but I was feeling a longer nail than usual. My nails never grow long, usually at a certain length they'll just stop growing and it's pretty annoying. The color that I picked today was an Essie polish called Fiji. Fiji is a popular soft, pale pastel pink. I absolutely love pastel colors so this was right up my alley. In New York, it's really starting to get hot but some days aren't so I was looking for that perfect spring color. If any of you guys have tried the new Summer Collection, let me know! Those colors are gorgeous! Hey everyone! 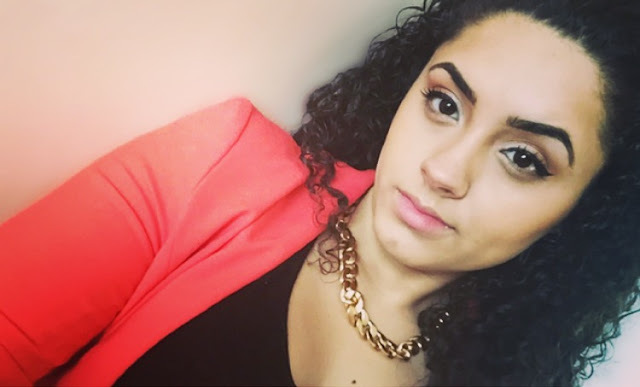 My name is Destiny and I am the blogger behind MsBeautyGlam.com. I am a 21 year old girl currently living in New York City. I am a psychology major trying to focus on school and writing. I am passionate about many things, one of those being makeup. Feeling the constant need to immerse myself into something, I felt for a long time that I needed some sort of outlet to creatively express myself and then, there came a blog. I am, in no way, an expert in anything. However, I am a lover of many things. A few years ago, I barely even touched makeup because I never felt like I wanted to. But then, mascara came and lipgloss and before I knew it, I had a full face of makeup on and I loved it. I became obsessed with watching Youtube videos of these beauty gurus that looked so gorgeous and started to recreate each look. I loved the feeling of creating a new look and that's when my love affair began. I am just a consumer, like yourself, that has done a ton of research on beauty over the last few years.